From time to time, we all deal with disappointment at work. It just happens. A hiring manager can choose the wrong candidate to fill a vacancy, a project sponsor can suddenly pull support, and a colleague can stab you in the back. One of the hallmarks of a successful employee is the ability to handle these situations with professionalism. A potential pitfall in handling disappointment is appropriately expressing your feelings to those above you in the organizational hierarchy. To avoid a career-limiting mistake in this area, follow these tips on expressing disappointment to your boss. In any workplace, some things evoke strong emotions. Say someone else takes credit for your work and gets away with it. No matter what line of work you’re in, that is a highly offensive action and demands a timely response. If you’re disappointed in the workplace, take a little time to understand what you’re feeling and why you’re feeling that way. Do you have all the facts? Are your opinions supported by facts? Going back to the example above, are you certain the other person took credit? How do you know that is what happened? What are the factors at play possibly affecting the situation? Don’t let your emotions get ahead of your facts. Understand what is going on and how it is affecting your attitude. Words are powerful. 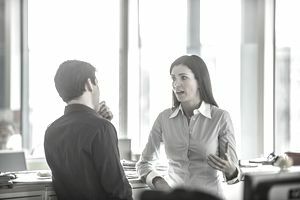 Precise language is important, and that importance is amplified when the conversation is a difficult one like when an employee needs to express disappointment to his or her supervisor. When you express disappointment, be careful about the words you choose. Avoid unintentionally blaming someone for something they did not do. For instance, do not blame your boss for doing something that is required by organizational policy. If your boss is required to document a performance problem you agree formally is an issue, do not insinuate your boss is at fault for the issue being documented in your personnel file. The conversation should remain focused. Do not drift from one complaint to another without explicitly doing so. When the conversation drifts, little is resolved, and if there are remedies agreed upon, they may not address the right topics. Being disappointed boils down to your expectations not being met. You thought one thing should have happened, but it did not, and something else did. When you go into the conversation with your boss about the disappointment, know what you want to get out of the conversation. Do you want to be heard and have this opinion factored into future decisions? Do you want some remedy for the harm you’ve experienced? Do you want a reversal of whatever decision led to your disappointment? Knowing what you want helps you frame and steer the conversation. This might sound manipulative, but it isn’t if you do not intend to be manipulative. You probably have a set of logical points you want to outline sequentially to set up what you want to happen. There’s nothing wrong with outlining how you want the encounter to play out. You may go into the conversation knowing exactly what you want to happen during and after the conversation but keep an open mind. By virtue of his or her organizational position, your boss may have insight into your issue you do not possess. The ideas you went into the conversation with may be rendered moot or ineffective by the new information your boss brings to the conversation. Be open to solutions, alternatives, and compromises. The ideas your boss brings to the table may be much better than yours. In healthy organizations, people who express concerns respectfully are valued for challenging the status quo. They reduce the likelihood of groupthink and stagnation. In unhealthy organizations, people who speak up are considered naysayers and barriers to progress. Know which type of organization yours is. If you work in an unhealthy organization, think carefully about whether the potential consequences of speaking up are worth whatever might be gained from the conversation. Some fights are not worth picking if you know you are going to lose. If you work in a healthy organization, follow the advice here. Your boss will genuinely try to understand your opinions and will seek the best resolution for everyone.